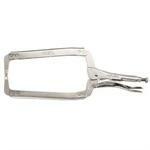 locking plier | Product tags | Waltco Tools & Equipment, Inc. This 18-inch Locking with Regular Tips has wide-opening jaws to provide greater versatility in a wide variety of shapes. Vise-Grip Locking have a very powerful locking mechanism. The locks work with the squeeze of one hand. Vise-Grip Locking are made of high-grade alloy steels that are heat treated for maximum toughness and durability. The adjusting screw gives exacting pressure. Simply turn the adjustment screw to change the jaw opening and pressure. It will stay adjusted for repetitive use. The guarded release helps keep work fast and safe. The guarded release trigger quickly unlocks. Vise-Grip is the only locking tools people ask for by name. Full lifetime warranty. Each Vise-Grip tool is warranted to be free from defects in, material and workmanship for the life of the tool, except for damage caused by abuse, misuse, or alteration. 6", with a jaw adjustment of up to 2", and a throat depth of 1 1/2"
11", with a jaw adjustment of up to 4", and a throat depth of 2 5/8"
The Irwin 20-11SP Vise-Grip The Original 11-Inch Locking C-Clamps with Swivel Pads have jaws that open up to 4 inches and a 2-5/8-inch throat depth for bigger jobs. Their leveling swivel pads protect material from damage, and these clamps have an easy locking and release action for added convenience. Construction from high-grade heat-treated alloy steel maximizes toughness and durability, and the screws stay in place for repetitive use of the clamps at the same setting. These clamps come with a full lifetime warranty. This 18-inch Locking Clamp with Swivel Pads has wide-opening jaws to provide greater versatility in clamping a wide variety of shapes. The swivel pads are for holding without damaging work surface. Vise-Grip Locking Clamps have a very powerful locking mechanism. The locks work with the squeeze of one hand. Vise-Grip Locking Clamps are made of high-grade alloy steels that are heat treated for maximum toughness and durability. The adjusting screw gives exacting pressure. Simply turn the adjustment screw to change the jaw opening and clamping pressure. It will stay adjusted for repetitive use. The guarded release helps keep work fast and safe. The guarded release trigger quickly unlocks. Vise-Grip is the only locking tools people ask for by name. Full lifetime warranty. Each Vise-Grip tool is warranted to be free from defects in, material and workmanship for the life of the tool, except for damage caused by abuse, misuse, or alteration. 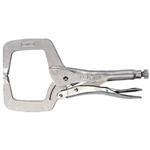 This 9-inch Locking Welding Plier is one of Vise-Grips' Locking Specialty Tools. 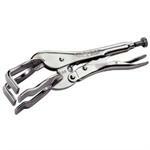 This locking welding plier has U-shaped jaws for visibility and working space. It holds work in proper alignment. The adjusting screw gives exacting pressure. Simply turn the adjustment screw to change jaw opening and pressure. It stays adjusted for repetitive use. The guarded release trigger helps keep work safe and fast. It will quickly release and unlock when needed. Vise-Grip is the only locking tools people ask for by name. Full lifetime warranty. Each Vise-Grip tool is warranted to be free from defects in, material and workmanship for the life of the tool, except for damage caused by abuse, misuse, or alteration.